If you thought the ‘I am rich’ application that two or three numpties bought for their iPhone a while back was crass in the extreme (the application, which cost almost $1,000, simply displayed a glowing ruby, with the words ‘I am rich’ on the phone’s screen) you’ll be no doubt interested to learn that Apple’s App Store has sunk to a new low. This really takes the bad PR biscuit: Apple this week had to remove an app from the store called Baby Shaker; a game in which a crying baby pictured on screen must be silenced by shaking the handset (and activating the accelerometer). Nice. This generated a good deal of negative comment, as you might imagine, with one infant health campaigner even going as far as to accuse Apple of encouraging people to shake actual babies to death. Well, steady on, the Informer thought, there’s no evidence that Apple wants people to go out and commit infanticide, let’s make that quite clear. Rather, what we have here is an example of very bad taste. What makes it interesting is that Apple is renowned for the totalitarian control it exerts over which applications are allowed into the hallowed virtual halls of its marketplace which rather suggests one of its staff gave Baby Shaker the thumbs-up. A PR booboo this may have been, but it hasn’t dented Apple’s financial performance. Strong iPhone sales – 3.79 million units, up 123 per cent year on year – helped the company’s Q109 revenues up to $8.16bn, compared to $7.5bn for the previous year. Net profit was $1.2bn, up from $1.95bn in 2008. Fellow handset maker Samsung turned a profit for Q1 as well, netting $461m – better than its Q4 results but still more than 70 per cent down on Q108. It was the phones wot won it, as other units, such as LCD screens and memory chips are having a bit of a shocker. It wasn’t enough to please the markets, though, and Samsung’s shares dropped by 3.67 per cent in Seoul. In other handset news, Google promised this week that 2009 would be a big year for its Android OS platform. With almost four months of 2009 already gone, though, and only one Android handset currently on the market, the Open Handset Alliance – the grouping that centres on the Android platform – has some way to go. It was announced this week that the HTC Magic, Android handset number two, which was unveiled at Mobile World Congress in Barcelona two months back, will debut in the on May 5th with Vodafone in the UK, Spain, Germany, Italy and France (with SFR). Vodafone, along with the rest of the UK mobile operator community must be tired of 3UK, with its disruptive ways. All that work those poor carriers have done to protect their business models and pricing strategies and that pesky 3 – which long ago discovered the futility of control freakery – comes along and starts giving customers better value for money, damn it! The latest ruse from 3 CEO Kevin Russell and his merry band is to allow 3 customers to make free Skype to Skype calls without incurring data charges. From the beginning of next month, anyone with a 3 Skype-enabled handset will be able to Skype to their little heart’s content and it will be free as a bird. And from the summer this will include users with unlocked handsets and 3 SIMs, even if the Hutchison-owned carrier didn’t supply the handset. “Communication through the internet is exploding. Internet calling or VoIP, social networking, instant messaging and email are used by millions in the UK every single day. They are open to all on their PCs and laptops. We want people to be free to communicate from their mobiles in the same way as they do from their PCs,” said Kevin Russell, CEO of 3 UK. Russell is gambling that free Skype will act as a customer adhesive, as well as encouraging users to initiate more traditional calls, send more text messages and browse the internet. IDC research director John Delaney commented that the latest move was in line with 3’s policy of going things “that other operators are reluctant to do”. Other UK carriers, of course, have tried to suppress Skype by insisting that the application is removed from handsets by vendors. But Delaney reckons that 3’s latest move will not really mess with existing call revenues, given that most Skype calls are made to PCs rather than other mobiles. “We think it is unlikely that Skype will significantly cannibalise conventional call revenues, at least until the number of Skype phones reaches a much higher percentage of total phones in use. If the number of Skype phone users in the UK gets into the tens of millions, voice cannibalisation will become a more pressing issue – but we suspect that’s a problem that 3 would love to have to deal with,” Delaney said. Meanwhile, investment tycoon Richard Li – son of Hutchison-owner and Asia’s richest man Li Ka-shing has quite a different problem to deal with, finally relinquishing his bid to buy out Hong Kong carrier PCCW for US$2bn. The deal has been the focus of a drawn-out legal battle, and Li’s withdrawal came hot on the heals of an Appeal Court judgement that blocked the deal, in light of allegations from Hong Kong’s financial market regulator that the shareholder vote had been manipulated. The other major shareholder in PCCW is China Mobile. Not too far away, in Taiwan, lonely WiMAX pioneer Clearwire is looking for a pen-friend in Global Mobile, one of six WiMAX licensees in Taiwan, according to local reports. 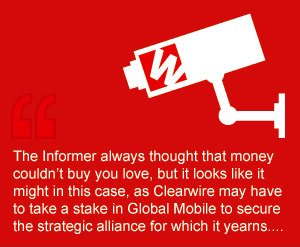 The Informer always thought that money couldn’t buy you love, but it looks like it might in this case, as Clearwire may have to take a stake in the Taiwanese carrier in order to secure the strategic alliance for which it yearns. Not least because Global Mobile might not be able to launch without a further capital injection. Although the six 2.5GHz WIMAX licences in Taiwan were awarded in July 2007 – three for the northern part of the island and three for the southern part – none has yet managed to launch commercial service. Lack of funding, combined with the economic downturn, has been the main reason for the delay. The economic downturn was also responsible for a profit warning from Deutsche Telekom this week, which said that EBITDA would be up to four per cent lower for 2009 than was originally expected. Monthly ARPU (average revenue per customer) in the US fell as a result of lower roaming revenues due to a decrease in consumer travel, while the rollout of the carrier’s 3G network increased expenditure and costs. Polish operation PTC suffered considerably from the sharp decline in its home currency, the Zloty, which fell around 26 per cent year on year against the Euro. Meanwhile T-Mobile UK recorded a significant drop in revenues of around 21 per cent due to the fall in the value of Sterling. Michael Kovacocy, European telecoms analyst and sector strategist at Daiwa Securities, offered a downbeat assessment of the firm’s UK position “Based upon our analysis, the UK business suffers not simply due to the existence of one too many competitors. T-Mobile UK’s problems go deeper, in that market maturity has combined with macro-economic weakness to drive customers increasingly towards price-sensitive behaviour and SIM-only offers. We have been bullish on the prospects of SIM-only for some time, but there is a difference between being a leader and 1st mover (Telefonica/O2 and “Simplicity”) and a follower,” he said. To make matters worse, T-Mobile’s German network suffered a nationwide collapse on Tuesday, leaving nearly 40 million customers without voice and SMS. No details have yet emerged on the nature of the outage, although some reports suggest a “software glitch”. D’oh. DT will doubtless have been delighted to hear of Viviane Reding’s latest achievements, as the European Commissioner for the Information Society and Media’s proposals for data roaming price caps were voted in by the European Parliament on Wednesday. As of July 1, a text message sent from abroad in the EU will cost no more than €0.11 instead of €0.28 today, and the wholesale price of data will be capped at €1 per MB, compared to an average wholesale price of €1.68 per MB. The wholesale cap will fall to €0.80 in 2010 and to €0.50 in 2011. Mobile operators will also be required to bill roaming calls by the second from the 31st second of the call at the latest, which will end the current practice under which consumers are overcharged by up to 24 per cent, the authority said. European consumers are expected to save up to 60 per cent on their bill for using a mobile phone abroad in the EU as a result of the caps. It’s just a shame none of us can afford to go on holiday any more. strong iPhone sales ??? Where??? second quarter drop in a row. Did the informer report strong Nokia sales? and 42% of the iPhones sold are sold at ONE operator in the US. I think everyone’s missed the point. This app appeared along with the Bush Admin torture letters. I think there is a connection, no? The WiMax Forum claims there are 460 WiMax deployments in 135 countries (see http://wimaxforum.org/node/644).